Kwanzaa is a celebration of ideology that is observed for seven days, from Dec. 26 through Jan. 1. It honors universal African heritage and is a celebration of family, community and culture. The holiday is symbolic of the tribal and family gatherings during a harvest. Created in the 1960s by activist and educator Dr. Maulana Karenga, the intent was to encourage African-Americans to return to the traditional values of family and community from their heritage. Karenga is a professor and the chairman of the Department of Africana Studies at California State University, Long Beach. Ujima (collective work and responsibility): To build and maintain our community together, to make our brothers’ and sisters’ problems our problems and to solve them together. Nia (purpose): To make our collective vocation the building and development of our community in order to restore our people to their traditional greatness. Centered on the home and family, the holiday features many traditional ethnic dishes. Kwanzaa is the Swahili word for “first” and refers to the first fruits of a harvest. Each night is accentuated with storytelling, music, dancing, drums and big traditional meals that include meats (symbolically) from Africa. The family gathers around the kinara, and a child lights one candle representing one of the principles each night. The kinara holds seven candles: one black, three green and three red. The black candle is lit the first night, Dec. 26, and represents Umoja (unity), the basis of success. The three green candles on the right side represent Nia, Ujima and Imani. The three red candles on the left represent Kujichagulia, Ujamaa and Kuumba. Collectively, the candles are called Mishumaa Saba. The kinara is placed on a straw mat (from Africa or made from African products) called a mkeka. An ear of corn for each child is also placed on the mat. If there are no children, then two ears are placed to represent the family’s commitment to the children of the community. Corn represents fertility and the future. Each night after the respective candle is lit, the family joins in discussion of the principle the candle represents. It is a time when traditional values are reinforced and pride in identity is cultivated. 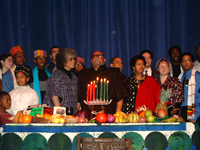 On the sixth night, after a red candle representing Kuumba (creativity) is lit, there is a great feast called Karamu. The ceremonial feast can take place in the home or in a larger congregation. On the seventh day of Kwanzaa, when the family is celebrating Imani, it’s customary to exchange meaningful gifts, especially for children, to reward accomplishments and the fulfillment of promises. Handmade gifts are encouraged in lieu of store-bought to avoid the commercialism and indulgence that abound during the season. The recipient, by accepting the gift, is bound to fulfill commitments and uphold the seven principles. By accepting the gift, one also becomes a symbolic member of the family and community, and the acceptance promotes unity.